I’ve spent the last 2 months with Black Rhino Concealment’s Oscar Mike Wallet in my back pocket… and I don’t plan on that changing after this review is completed. The Oscar Mike Wallet (or On the Move Wallet) is an ultra-compact wallet created from rugged materials. 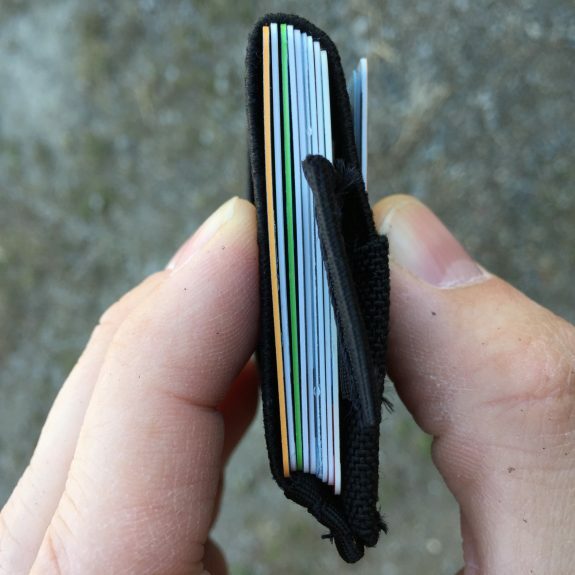 The wallet is built around a webbing sleeve that can hold around 10 cards. 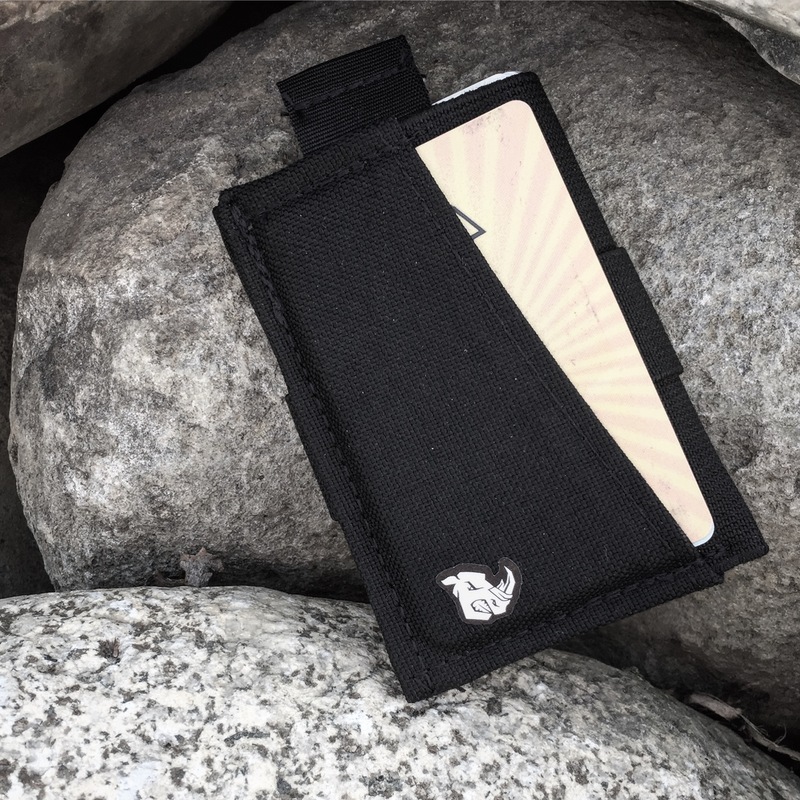 The sleeve contains a simple webbing pull tab that allows you to lift the cards partially in order to sort through and find the one you need. The front of the sleeve has a nylon card slot sewn to it that can be used to provide immediate access to your 2 most used cards. 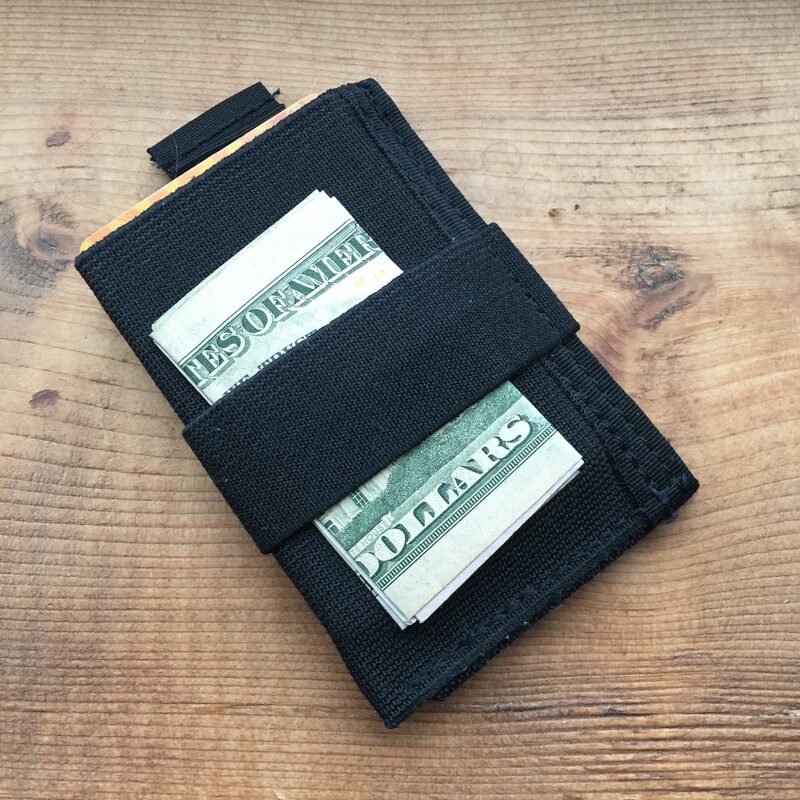 The back of the sleeve has an elastic strap used to hold folded cash. There are lots of wallets on the market. Some offer great access and organization. Some are extremely compact. The impressive thing about the Oscar Mike Wallet is that it offers great access and organization in a very compact wallet. I have 9 cards in the sleeve and 2 in the nylon card slot and this wallet is still very compact. It pretty much disappears in the back pocket of a pair of jeans. Yet, in spite of how small this wallet is, I have immediate access to everything in it. I keep my ID and the only credit card I used in the front pocket where they can be accessed without even having to unfold a wallet. The rest of my cards like insurance cards or reward program cards are kept in the sleeve where they would be real pain to access if it wasn’t for the “Quick-Draw Tab”. This is a simple strap that wraps under the cards so that when you pull it, it lifts the cards out of the sleeve. I usually just lift them about 1/3rd of the way out of the sleeve so that the elastic is still holding them tight but I can fan them slightly to find the card I need. It is a dead simple system that works perfectly and it might be the coolest thing about this wallet. I never would have thought you can stack that many cards into a deep elastic pouch and expect to be able to easily retrieve the one you want. The one issue that I always have with these compact wallets is how they handle cash and coins. When ever someone hands you change, you have to deposit the loose change in your pocket, then fold the bills before putting them on your wallet. It takes longer than something like traditional bi- or tri-fold wallet but then again, you get to avoid the chiropractor visits that come with carrying an overloaded traditional wallet. This is probably the smallest wallet I have ever owned and that is a nice thing in and of itself. However, compact wallets can be more of a pain than a convenience if you can’t access what is inside of them easily. That is what sets this apart from other wallets I have tried. Sure, it’s small… but it also gives you easy access like a larger wallet. I like it enough that it is still in my back pocket as I type this even though I really, really liked my previous wallet. Disclosure: This wallet was sent to me, free of charge, by Black Rhino Concealment.